These are words that strike fear in my heart. My hands become clammy and suddenly it feels like the room is spinning. My mind begins racing at a hundred miles an hour, where could he have gone? How did I fail to notice he was missing? No, Rupert isn’t my son. He’s my son’s rabbit. He is also my lifesaver. Our Rupert addiction started slowly and innocently, as these things often do. A few weeks after Buddy’s birth we received a box filled with gifts from a family friend. I was instantly drawn to the beautifully soft grey Bunny with his long floppy ears and legs. In my innocence as a first time mum I felt it would be useful to have a soft toy that Buddy could be attached to, so I dutifully spent several days with poor old Rupert shoved down my top to make him smell like me. The love started the moment the two met. Buddy grasped Rupert and has rarely let go of him since. Whilst this was lovely, we soon discovered that this close bond presented inherent problems. Lovely soft grey bunnies don’t stay lovely, soft or grey for long whilst in the clutches of an infant who is non discriminating in the direction of his vomit. After enduring the trauma of Buddy’s look of betrayal during Rupert’s first bath, we decided to buy another one, or two. Fortunately, Buddy has never been upset by the changing Ruperts. The original is now thoroughly bedraggled and I have had to sew his ear back on following the teething months. He doesn’t care which Rupert he has, as long as Rupert is there. I have started to depend on this. When we go on a road trip I know Buddy will be fine, because we have Rupert. When he has his immunisations he calms as soon as Rupert is in his hand. I never worry about leaving him with a family member, as long as Rupert is there. Rupert has become an extension of motherly comfort, yet he is more than that. He has become Buddy’s friend. Every morning when he wakes Buddy will sit in his cot talking to Rupert until he wants to get out of bed. During the day he takes Rupert exploring with him, holding him, snuggling him and laughing at him throughout. We now have six Ruperts and one contented little boy. Yet this doesn’t lessen my anxiety when one is missing. The Rupert addiction is growing. What if he starts needing three? Am I approaching a crisis point where one or two lost Ruperts will result in a meltdown, a refusal to sleep or play without two, three or four of his best friends in his grasp? The day Rupert went missing was Buddy’s first birthday. We had gone to the seaside and were enjoying an early morning stroll around the town. I don’t know what made me look in the pushchair. Buddy was quite content and babbling away, he smiled at me with a cheeky glint in his eye…. This initiated an hour long frenzied trawl back to every shop we had been into. I was a woman possessed. I ran into every shop, asked every sales assistant, crawled on the floor commando style peering under shelves and into every nook and cranny. I was driven, not only by the certainty of a hellish day without our safety net, but a bizarre need to ensure Rupert was okay and hadn’t been adopted by a rabid dog as a new favourite chew toy. 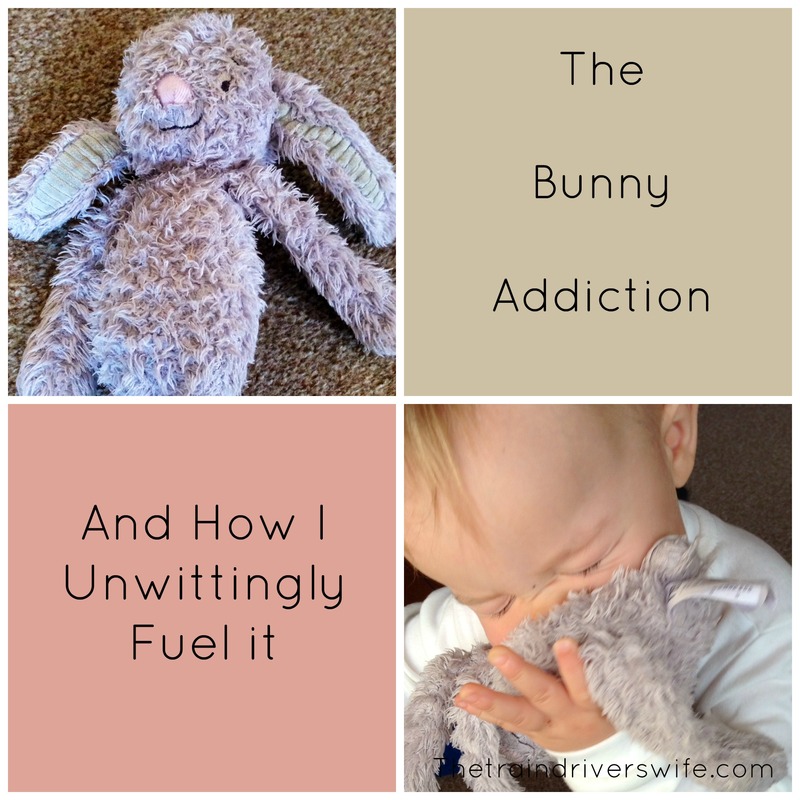 I’m far too attached to this Rabbit for my own good…. Buddy had begun to feel the effects of his mischief. It was no longer funny to have thrown Rupert from the pushchair. He missed his friend. Fortunately, a Good Samaritan found Rupert. Whoever that kind person was must have recognised the signs of an adored toy (chewed ears, mucky and bedraggled) and they tied him by the legs to a fence where we were walking earlier that day. After a quick wipe down, Buddy and Rupert were reunited and peace was restored once more. I don’t know if and when the Buddy and Rupert love affair will end. I don’t know if it is a good or a bad thing that he is so attached to an inanimate object. I don’t think anyone really knows how the seemingly small decisions we make in the early days become so significant, months or years down the line. All I know is that when I’m feeling tired and Buddy comes over to me and rubs Rupert on my face, I kind of get why he loves that Rabbit. I love this tale. I am glad someone found Rupert. I hope in a way Buddy’s love for the Ruperts continues, but in a way I can see you wanting it to end (sort of). I slept with my stuffed whale Wally until I was around nineteen (years, not months). It still surprises me the original Wally never had to be replaced and is still relatively intact. This is lovely, my friend’s son had a little blue dog and he called it, ‘Bish’, it was made of a fine towelling material. like Rupert, it was sucked and bitten and they bought a second one for when the original one became dirty or covered in baby sick. Bish was taken everywhere but after about the age of 2, he became less and less interested in him. Although he only ever seemed interested in one ‘Bish’ at a time, Bish finally made way for Lego but not in the same way. The ‘little’ boy is now 11 and will be going to his new comprehensive school in September. Haha thank you! I think we may need that luck. Buddy has a knack for throwing Rupert when we least expect it, bless him! I’m sure one day we will be able to go cold turkey on Rupert! Thanks for visiting! Aw, I like this story. My son has his thumb. I’ve tried giving him stuffed animals but he just throws them out of the crib. He pushes his blanket to the corner. Haha. Babies are so different! It is sweet to see him love his Rupert so much bless him. Hopefully he will outgrow it one day! Thanks so much for visiting and taking the time to comment! I am so pleased Rupert was found safe and sound. I think we have all had that moment of panic – my son has a zebra that he takes everywhere, and when we are out and about I put my older children on ‘zebra watch’ to make sure he is spotted if he is thrown from the pushchair. It’s ridiculous really lol. Haha maybe that’s where I’m going wrong, I need some older kids!! Ah, the love of a cuddly toy. I used to be attached to a little teddy and completely wore him out, my mum had to repair him numerous times over. My children on the other hand, I am really surprised are not attached to anything. I KNOW this feeling way too much. My son is now 4 and still can’t live without his star blanket. I can imagine him collecting his GCSE results with it tailing behind him! Haha aw Amy I hope not! Bless them, our boys must need their snugglies! We have ‘bunny’ a pink comforter from tesco, we bought 3 and rotate them regularly, she now prefers a fresh one straight from the wash, a sniffy one she calls it! I’m glad we have 3!